It’s rather easy, and undoubtedly necessary, to lambast President-elect Donald Trump and his team of corporate parasites who will soon head nearly every key agency in the U.S. government. Of note are the pro-fracking, anti-environmental protections positions of everyone from the nominee for secretary of state, ExxonMobil CEO Rex Tillerson, to the incoming head of the Environmental Protection Agency, Scott Pruitt. Such appointments signal a reckless abandonment of even the pretense of safeguarding vital resources such as air, water, and soil, among many others, at a time when many in the scientific community are ringing the alarm about our quickly unraveling biosphere. However, while we rightly protest against this direct threat to our existence as a species, many have chosen to employ the age-old tactic of every ideologue from time immemorial: selective memory. Indeed, it wasn’t Trump, but President Barack Obama, who held the reins of the federal government and did nothing while drinking water contamination poisoned the people of Flint, Michigan. It was Obama who expanded offshore oil drilling while paying lip service to environmental responsibility in the wake of the Deepwater Horizon spill — a 2010 disaster which continues to wreak havoc on the Gulf of Mexico’s ecosystem. It was Obama who signed off on new oil pipelines, approving the construction of the equivalent of 10 Keystone pipelines between 2010 and 2015 alone. Oil and gas shipments by rail continued under his watch. These are just some examples of the countless other irresponsible policies. Forgive me if I don’t offer the liberals a post-consumer recycled handkerchief for their eco-friendly crocodile tears. Although issues such as climate change are simply too all-encompassing, too staggering in their scope and scale, to simply be chalked up to bad policy and bad leadership, specific public health crises are not. And President Obama has indeed stood idle while communities, and in some cases even entire cities, fall victim to water contamination. The most well-documented example of this sort of gross negligence is the ongoing health emergency in Flint, Michigan. Once a thriving working-class industrial city, Flint has seen poverty rates soar while its city infrastructure deteriorates thanks in no small part to racism and endemic corruption by city and state officials. And it is, of course, the children of the poor who are most directly impacted by the lead contamination. In late 2015, researchers found that the levels of lead in the blood of Flint’s children were so high that a state of emergency was declared. And while Obama did eventually make an appearance in Flint to pose for photos and, in typical Obama fashion, deliver an emotionally charged but politically vacuous speech, he has done almost nothing to address the underlying problem in Flint. With one word, one executive order, Obama could have brought the power of the presidency down on Michigan Gov. Rick Snyder and other public officials who are directly responsible for the crisis. But he never did, preferring instead to deliver the kinds of hollow platitudes that have become his trademark. It is rather striking that more than a year after the Flint crisis came to public attention while Obama was finishing another round of golf or shoring up his “Commander-in-Cool” image with interviews for Vice and “The Tonight Show with Jimmy Fallon,” the full scope of the crisis is now becoming clear. “The poisoned places on this map stretch from Warren, Pennsylvania, a town on the Allegheny River where 36 percent of children tested had high lead levels, to a zip code on Goat Island, Texas, where a quarter of tests showed poisoning. In some pockets of Baltimore, Cleveland and Philadelphia, where lead poisoning has spanned generations, the rate of elevated tests over the last decade was 40 to 50 percent. Such findings would undoubtedly be scandalous were it not for a corporate media more interested in political wrangling and Trump’s latest tweets than in covering the full scope of a story that amounts to intergenerational economic and physical oppression. For it is the poor and working class communities, most of which were formerly industrial cities, where the problem of lead poisoning is at its worst. These communities are often predominantly comprised of people of color and immigrants who are disproportionately affected by this level of federal, state, and municipal neglect. So, following on the heels of an election which has spotlighted the plight of the working class in America, it might be useful to ask the question: What, if anything, has Obama done to alleviate this problem? Have his policies improved the situation or made it worse? Of course, the sad reality is that neither Obama nor any other Washington insider has the faintest concern for the health and well-being of people depending on their local water sources for both physical and economic survival. If Obama cared even a little, he would not have peddled hydraulic fracturing, or fracking, in the Gulf of Mexico in the aftermath of the devastating Deepwater Horizon oil spill in 2010. Mike Ludwig reported for Truthout in June that documents released to Truthout and the Center for Biological Diversity under the Freedom of Information Act revealed that the Obama administration approved more than 1,500 applications for offshore drilling plans — including fracking at hundreds of wells in the Gulf of Mexico — from 2010 to October 2014. More recently, the Sioux Nation and their allies have taken a stand in defense of water and sacred land against corporate greed in the ongoing actions at Standing Rock as they attempt to block the Dakota Access pipeline from being built on their land. And while Obama waxed poetic about indigenous peoples having a voice in the White House during both his 2008 and 2012 campaigns, it seems he couldn’t be bothered to speak in defense of the oppressed indigenous community now that he’s comfortably ensconced in the Oval Office. It is well known to both environmental activists and millions of ordinary citizens alike that fracking can have severe ramifications for groundwater, as harmful chemicals are injected into the rock beneath the soil while millions of gallons of fresh water are expended per fracking well. Yet, despite the clear and unmistakable evidence of deleterious effects on drinking water, the Obama administration moved forward with supporting the technology, despite public opposition to it. As usual, Obama was speaking out of both sides of his mouth. The president directed his Department of Interior to attempt to ban fracking on tribal and federal lands while simultaneously taking large campaign donations from the very oil and gas companies involved in fracking. 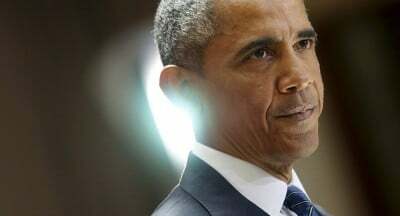 In fact, Obama took in nearly $2 million in campaign donations in 2008 and 2012 from companies that directly benefited from his administration’s focus on the development of domestic energy production, largely from fracking. And then, of course, there’s the queen of doublespeak, Hillary Clinton, who might as well have been the de facto proxy of the oil and gas corporations while she was secretary of state and during her campaign. Jesse Coleman, a researcher for the Greenpeace Investigations Team, noted in April that Clinton received roughly $7 million for her 2016 campaign — a staggering number when compared to any other industry not named Wall Street. In other words, Clinton promoted fracking as a geopolitical weapon in the interests of U.S. political goals. Far from the defender of environmentally responsible policy and development that she purported to be during the campaign, Clinton may go down as one of the principal agents of Big Oil in the ecocidal “shale boom” of the early part of this decade. Obama, Clinton, and the entire Democratic Party establishment may speak with one righteous sounding voice when it comes to blasting Trump and speaking to the American people about hope and responsibility with a straight face. And indeed, against President-elect Trump’s toxic agenda of dirty energy and dirty corporate politics, they may seem to be a better option. But, when we look past the façade of green politics, it becomes clear that the only green Obama and Clinton were ever interested in was money. Trump is undeniably the new and critical danger. But let us never forget that Obama, Clinton, and the liberal establishment paved the way for him.